The monsoon rains come in November, December, January and February. They continue for most of the day. The monsoon season in Malaysia didn't mean much to me until I came face-to-face with it recently in Kuala Terengganu, the state and royal capital of Terengganu. I was there on an assignment and soon realised that travelling is much more difficult during this period of heavy rain in the east coast states of Malaysia: Pahang, Terengganu and Kelantan. This year's monsoon rains have flooded many villages in the three states but that is another story. 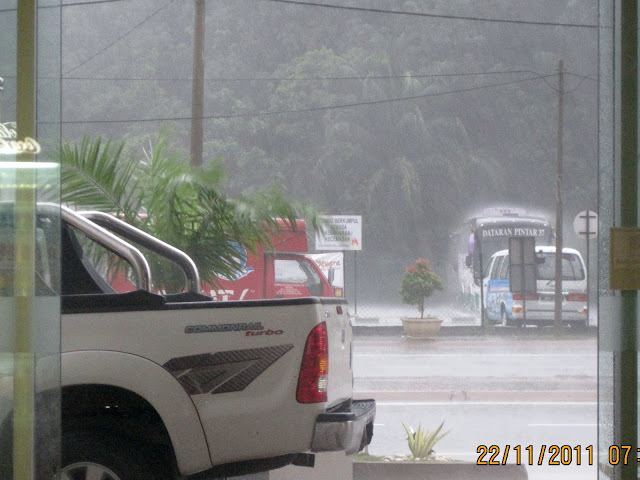 The monsoon blew relentlessly into my face as I dashed to the lobby of Felda Residence, my home for three days, from the vehicle that took me to the hotel from the airport. I dumped my stuff in my room on the sixth floor after checking in and came down to a waiting vehicle which will take my colleague and I to the famous Pasar Payang (Payang Market), the city's main shopping area. Even though it is not far from the hotel (a mere 20-minute walk), it would have been impossible to saunter to the market because of the rain. My shopping experience was an exciting one and the torrential downpour left my colleague and I stranded at the market. But I didn't mind. I have always liked the rain, which stopped long enough for us to get on a trishaw whose rider bravely cycled back to the hotel. As soon as we reached the hotel, it rained again. It was a day of intermittent showers and they continued for most of the three days we were there. Other colleagues from Kuala Lumpur who were with me in Kuala Terengganu constantly wondered about the social life of residents in the city during the wet months (November to February) and felt pity for what they were enduring. "What do they do at night?" asked Anis. It is business as usual, says a Terengganu-born teacher, who seems immune to this often asked question. My friend Nelson Fernandez, a journalist, who covered the east coast states for 10 years loves the rain, howling gale and rough sea. Others, like a photojournalist, find it a problem to cart her camera and other gear. For Fernandez, the mournful cry of the wind was at once sad and comforting. It worsened his loneliness (his family stayed back in Kuala Lumpur) but in some strange way it also consoled him. After a day of hard work, he turned to the roar of gale-force winds for solace. "It's hard to explain," says Nelson, who is now back in Kuala Lumpur. And when large and dangerous waves rise majestically from the ocean, he reminds himself that he is only a drop in the mass of salt water that covers most of the earth's surface. I see where Fernandez is coming from. I felt the healing power and cleansing quality of the elements too and without realising it I was in introspective mode. Overnight rain had freshened up the view from my room window. Then a light rain began to fall and it set in steadily by the time I went for breakfast. When I returned to my room, I looked out of the window and saw people walking in the rain, some with umbrellas, others without. I contemplated braving the bad weather and going for a walk. I stood by the window, hesitating over whether or not to do so. The fact that I didn't have proper rain gear stopped me from leaving my room. As the saying goes: "He who hesitates is lost." Did I lose a good opportunity in not going for a walk?